The Ladies' Killing Circle Inc. The Ladies Killing Circle, of which I am a proud member, received the 2012 Grant Allen Award at The Scene of the Crime Conference on lovely and mysterious Wolfe Island. How cool is that? 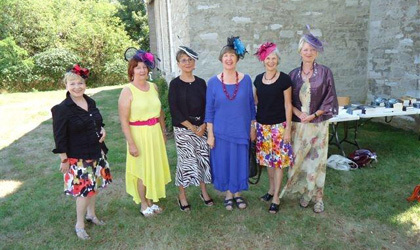 We were pleased to make our speeches in the historic Anglican church while wearing our new fascinators. Sure they look harmless enough, but the six writers who make up this group have a lot of explaining to do. 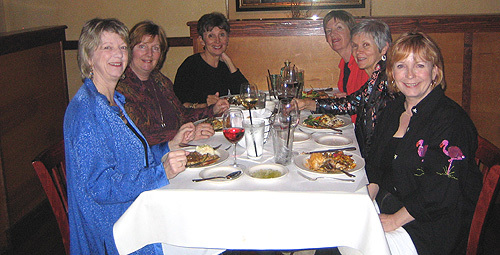 Joan Boswell, Vicki Cameron, Barbara Fradkin, Sue Pike, Linda Wiken and Mary Jane Maffini (that's me!) are more than just friends: we have murder on our minds. Our crimes include the seven Ladies Killing Circle anthologies. The Ladies Killing Circle, Cottage Country Killers, Menopause is Murder, Fit to Die, Bone Dance and When Boomers Go Bad feature light and dark mystery short stories from Canadian women authors. A new anthology, Going Out With a Bang, arrived in fall 2008, keeping up a dangerous tradition! Fit to Die, Bone Dance, When Boomers Go Bad and Going Out with a Bang are available through Dundurn in Toronto, This highly successful series of anthologies has netted ten nominations for Crime Writers of Canada's Arthur Ellis awards and scooped up three Ellis Awards. When not plotting or discussing new methods of dispatch, our group of co-conspirators can be heard laughing or sometimes spotted shopping. If all else fails, try the dog park. Or even Florida. All right, sometimes we're actually writing. 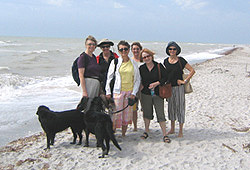 As you can see from these photos of the latest LKC trip, life's a beach and then you dine. No matter what we're doing, the memory of the wit and wisdom of our friend Audrey Jessup will never leave us. Audrey died in 2003, but is still with us in spirit.